IT WORKS! I think it’s better than boiled or steamed, too. 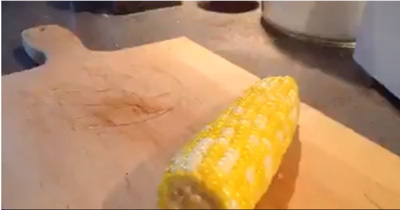 I hadn’t eaten corn on the cob for many years because it’s such a pain for one person, one ear of corn. I have two more corn ears and plan to buy more as long as it’s in season. See: SFGlobe’s short 22-second video on Facebook. i.e. leave the cobs intact inside their husks. Don’t wrap them in anything or put them in a microwave bag. remove from microwave with a hot pad. CUT the stalk and about 1″ of husk off with a sharp knife. squeeze the pointy end and the cob will slide out of the husk. this method removes the silk too. ready to eat. Butter and serve. HOT! I couldn’t get the cob to slide out as quickly as the lady in the video on my first try, but slide it did. I think the trick is to squeeze the husk right up at the tip and work your way down – with a hot pad, of course. Practice makes perfect. Delicious! I’ve been buying toaster waffles for years. They’re quick and convenient. But by the time we butter and pour syrup on them, they aren’t very hot, and they don’t have a lot of flavor beyond the syrup. Toast your frozen waffles on a hot griddle or large frying pan. No need to defrost. Use plenty of butter, re-buttering when you flip them over. A minute or so on each side is plenty. They brown nicely and quickly. As they’re now already buttered, just serve with syrup as you fancy. Enjoy. You’ll notice a tremendous improvement! Packaged grocery store foodstuffs are heavily over-salted to make them “taste good” and hide other flavoring and culinary deficiencies. If you are young, are not on a low-sodium diet by doctor’s order, and you enjoy canned soups or Top Ramen, for example, you are headed for medical issues. If you are already on a restricted sodium intake, you quickly find it’s almost impossible to shop for prepared foods that you like that also have low or even moderate sodium levels. The truth is that the McLaughlin Group behaves like a dysfunctional family that’s having a really bad day. There is, in plain fact, no moderation of this free-for-all verbal brouhaha. In the histrionics over table salt, conservative Pat Buchanan (well-known known to liberals as the racist, homophobic commentator and former journalist) came across as one of the sanest and most level-headed. Some air-head from the Washington Post said that the FDA proposal is further proof of the Obama Administration’s drive to increase government intrusion into the private sector, as evidenced by the proposal’s tendency to deprive Americans of free choice. What Part of “Moron” Don’t They Understand? This whole issue IS about free choice. There is no proposal to regulate the manufacture, sale or distribution of table salt, as is done with liquor, explosives, or prescription drugs. Reducing the salt content of prepared foods as a class restores free choice to Americans, since it is easy to add salt, but impossible to remove it. The shouters and screamers are always free to reach for the salt shaker and shower their dinner plates and soup bowls with thousands of extra milligrams of salt (and I hope they do), but the rest of us should be free to regulate our salt intake – up, or down – as we choose. 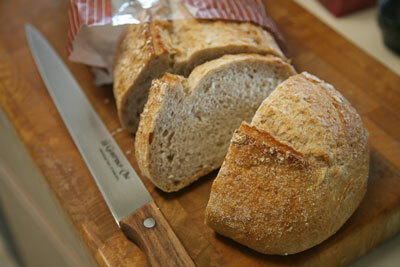 The greatest thing since sliced bread may be … unsliced bread. Fresh-baked, fresh slices on demand: mmmm, the real thing! Waiting for my flight at the airport, I caught a distinct whiff of Camembert cheese, of all things. You might have caught my earlier post on Camembert last month. I love Camembert, though, I’ll admit, it sure can get ripe. Camembert is a soft ripened French cheese that becomes stronger in flavor as it ages. It is not as strong as Roquefort, which at its best brings to mind off-prime baby diapers. Camembert is similar to Brie in flavor and consistency, but has been aged considerably longer — in deference to the true afficiando. You can think of Camembert as Brie on steroids. Camembert has becoming increasingly difficult to find in the local SF Bay area. I usually have to settle for Brie. I once asked a food clerk at our local upscale market if they carried Camembert. I received the stare that told me the clerk was wondering exactly why I would want women’s lingerie and why I came for it in this store. In Phoenix, no one seems to even carry Brie. It is almost like the old gag about looking for the Velveeta in the Gourmet Cheeses section. When I asked at my local Trader Joe’s they other day, they told me they consider it a Christmas item, and a shipment had just come in. I did the mature, grown-up thing, purchasing two rounds. It ages quickly, you know, so it must be eaten promptly. Mine has a pull-by date of 11-17-2008. A half a round a day will guarantee people will keep their distance for the better part of a week.